In order to ensure that American taxpayer dollars aren’t going into the pockets of powerful DC lobbyists, I introduced the No Lobbyists on Presidential Transition Teams Act to prevent president-elects and vice president-elects from paying registered lobbyists to be a part of presidential transition teams. Keep up to date with this bill here. President-elect Trump spent a lot of time on the campaign trail saying he was going to “drain the swamp” in DC. So far, it looks like he is breaking that promise to the American people. He is filling his cabinet and advisory roles with Big Money political donors like Betsy DeVos and DC insiders like Reince Priebus. He is also setting a dangerous precedent surrounding his business dealings; putting his assets in a “blind trust” that is operated by his children is not good enough. The American public needs to have confidence that the office of the Presidency isn’t being tainted by President-elect Trump’s business interests. The only thing Trump is doing to clean up the swamp is dressing the alligators up in suits and ties. Read more about how President-elect Trump isn’t draining the swamp here. Since the election, a number of you have come up to me and said, “I’m glad you’re there.” I think that means, “Thanks for looking out for us,” and I want you to know I’m going to keep doing the best I can. But I want to say the same thing back to you: “I’m glad you’re there.” I’m glad you’re there, holding strong, building a life, and all the while finding time to do things for others. That keeps me going. Thank you! I was proud to join with 169 of my colleagues in the House of Representatives to call on President-elect Trump to rescind his nomination of Stephen Bannon as White House Chief Strategist. Bannon is a leader of the radical right movement and bringing him into the White House inner circle is a flashing red danger sign about where the Trump Administration is headed. I wanted to thank you so much for all of your support during this campaign. Yesterday's vote of confidence from the people of Maryland's Third District was truly humbling. I look forward to continuing to work hard in Congress on behalf of my constituents and our country. America has been through a long and hard fought campaign for the presidency and last night's result was a surprise to many. We must move forward, finding opportunities to work together collaboratively, while recognizing that there will inevitably and justifiably be points of deep disagreement among us. Above all, we must listen to each other in good faith and with an appreciation that our diversity -- of backgrounds, of views, of convictions -- should be and can be the source of our greatest strength. Thank you to the Capital Gazette for endorsing my re-election campaign! It is a privilege to work on behalf of the residents of Anne Arundel County in the United States Congress. Anne Arundel County has a rich and diverse history and is home to strong communities, proud residents and national treasures, such as the U.S. Naval Academy. With an unrivaled combination of military installations, cyber and defense contractors, major health and educational institutions, and vibrant small businesses, the county has become a key economic engine driving growth around the Baltimore-Washington Airport, Fort Meade and beyond. At the same time, the hundreds of miles of shoreline that touch the county have inspired its citizens to exercise special stewardship over the health of the Chesapeake Bay. Keeping our republic has become the passion of millions of Americans who are convinced that their government is broken. They see a Congress captured by special interests and frustratingly unresponsive to the needs of everyday Americans. Whatever else they may disagree about, Democrats, Republicans and Independents have all arrived at the same explanation for the rot in our politics: Big Money. According to a recent Ipsos poll, 7 in 10 respondents agreed that our democracy is at risk if action is not taken to address the undue influence of money in politics. The same poll found that 8 in 10 respondents view that influence to be worse than at any other time in their lives and an overwhelming 93 percent of respondents felt that elected officials listen more to big-money campaign donors than to regular voters. Today is the 96th anniversary of women winning the right to vote. While we are on the verge of electing our first female president we need to remember that we still have work to do when it comes to securing equal pay for equal work and electing more women into office! The National Park Service turns 100 years old today! Maryland is home to 18 wonderful national parks and this weekend all entrance fees are being waived to celebrate their centennial. Learn more about the National Park Service's Centennial here. Learn more about the parks located in Maryland here. Back in the day, before Michael Phelps competed in his first Olympics, he and I used to share the pool at Meadowbrook in Mt. Washington. At 23 years his senior, I used to pace myself by trying to swim one lap for his every two. I couldn't even do that. Anyway, we chose different paths from there. Michael decided to become the greatest Olympian of all time. I went into politics. Sometimes I think about how different things would have been if I'd been a better swimmer. Oh well .... Congratulations Michael on making your hometown of Baltimore and Towson High School (where all my kids graduated) so proud!! 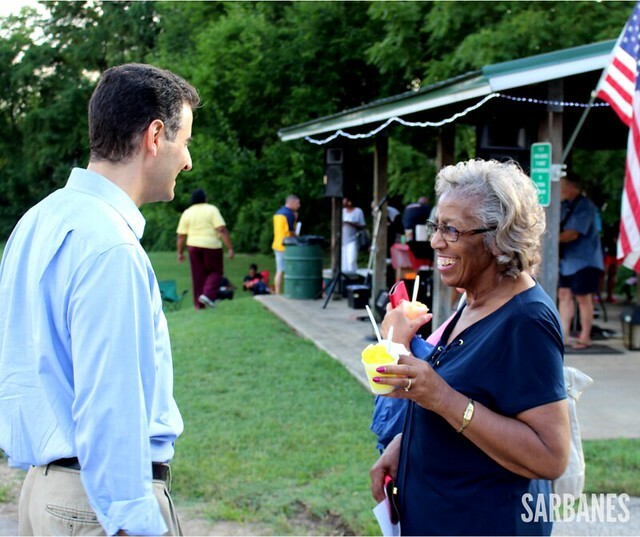 This year I had the chance to go to the National Night Out events in Onley and Halethorpe. It's always a great night for members of the community to come out and meet our first responders and law enforcement personnel. Click below to see a quick video from the Halethorpe event. Click on the left or right of the photo to scroll through an album of photos from Olney and Halethorpe's National Night Out events. I am proud of the great strides we have made as a nation over recent years when it comes to making sure every American, no matter who they love, is treated equality. We have seen the reversal of Don’t Ask Don’t Tell in our military, marriage equally passed on a national level, and just last month President Obama named Stonewall National Monument in New York City the first national monument to LGBT rights. However, the GOP's recently released platform has been named the most anti-LGBT platform ever. We need to push to make sure that Democrats win in November to ensure the progress we've made in recent years isn't reversed. Last week the House passed the Comprehensive Addiction and Recovery Act of 2016 which included the Co-Prescribing to Reduce Overdoses Act (HR 3680) -- a bill I authored to help expand access to overdose reversal drugs like Naloxone. I believe the Co-Prescribing to Reduce Overdoses Act is an important tool in fighting the opioid epidemic in our country. I was proud to serve on the conference committee that worked to iron out the differences between the House and Senate bills. This package also passed in the Senate last week and has been sent to the President’s desk for his signature. Baltimore signed an agreement Tuesday with the U.S. Department of Energy and the Maryland Clean Energy Center to develop a financing model to make solar energy more accessible to low-income residents. Existing financing options for installing solar panels require a large up-front investment or high credit ratings, which can be prohibitive for many low-income homeowners. Details of Baltimore's financing model are still to be determined, but city officials said the goal will be to eliminate some of the barriers that prevent low-income residents from making the investment — as much as $15,000 for a typical Baltimore rowhouse. "We want to prove the clean-energy revolution in our country can be designed to include everyone," said David Foster, a senior adviser at the Energy Department. The new program eventually could serve as a national model, he said. Foster was among the officials and lawmakers, including Mayor Stephanie Rawlings-Blake and Reps. Elijah E. Cummings and John Sarbanes, who announced plans for the program outside a Belair-Edison home selected to receive solar panels as part of another city initiative to install solar panels in low-income areas. American women have always been on the front lines of voting rights, civil rights, and human rights. Today in 1848 women gathered in Seneca Falls, NY for the first women’s rights convention where they discussed the social, civil, and religious rights of women. We have come a long way in the fight for women’s rights in America but we still have a ways to go. Today women still make less than their male counterparts in the workplace and aren’t always able to take maternity leave. These and other issues that affect women and working families could be addressed more often if we had more women in elected office. One way to achieve this goal is to have citizen-owned elections, it’s been proven in places like Connecticut that once you give average Americans the ability to run and win seats in office their voices are heard and legislation can be passed to benefit the broader society. That’s why I authored the Government By the People Act, and am a strong supporter of the Disclose Act and the effort to overturn Citizens United. This year’s theme for Artscape was Space. It was great to wander around this annual festival and see how people interpreted that theme in different ways. There was everything from large planet models you could walk inside of to cool off to fellow festival goers dressed up as aliens. Visitors this year had a wide variety of activities to choose from with concerts to listen to, plays to watch, new video games to play, and local artwork to admire. I enjoyed the performance by the Orchkids at the Meyerhoff which is becoming an Artscape tradition. Artscape always brings out the creative side of Baltimore and I’m pleased that this year’s festival was such a success! Democratic members of Maryland's congressional delegation gather in an attempt to maintain pressure on the issue of gun safety legislation. Maryland gun-safety advocates met in Baltimore to support tougher laws connected to gun violence, setting up what could be an interesting debate next week on Capitol Hill. After last week's sit-in on the House floor, many of Maryland's Democratic members of Congress, along with gun violence prevention advocates and victims of gun violence, made an attempt to keep up the pressure on the issue, addressing a crowd in north Baltimore. Kate Ranta talked about being stalked by her ex-husband, who shot her and her father. "My son, who is 7 now, but 4 at the time, stood screaming, 'Don't do it, Daddy, don't shoot Mommy,' witnessing the whole thing. It was luck that no bullets entered his tiny body," Ranta said. Sheryl Baughman lost her son to suicide. She said she believes that a waiting list for the mentally unstable might have saved him. "Had they made him wait, maybe whatever circumstances were going on in his life that day could have been different," Baughman said. Maryland's Democratic political leaders also used the forum to call out Republicans for not working with them on gun legislation, but they had trouble giving reasons why no such legislation passed when Democrats had control over the House and Senate in President Obama's first two years in office. "I can't answer the question. I was on the intelligence committee, so I wouldn't have dealt with that to begin with, but I know it has always been an issue," said U.S. Rep. Dutch Ruppersberger, D-District 2. Others blamed a supposed stronghold by the National Rifle Association over Congress at the time. "The tide is turning, and the intimidation factor that operated on all of Congress at one point has begun to shift," said U.S. Rep. John Sarbanes, D-District 3. House Democrats frustrated over the lack of progress on a gun control measure staged a "sit-in" on the floor Wednesday, saying they would refuse to yield unless GOP leaders allow a vote on a "no-fly, no buy" proposal. The effort comes a week after Democrats launched a filibuster on the Senate floor in order to prompt a vote on similar legislation, which ultimately failed. Democrats have renewed their push for gun control measures in the wake of the Orlando night club shooting. Led by Rep. John Lewis, a Georgia Democrat, several dozen lawmakers sat on the floor of the House, which quickly went into recess -- a move that shuts off live coverage of the chamber by CSPAN. Every Democratic member of Maryland's congressional delegation joined the sit in, including Sens. Barbara A. Mikulski and Ben Cardin. "Congress has a basic duty to protect the American people, and that means putting in place commonsense gun safety laws that could help reduce the frequency and carnage of mass shootings in America," said Rep. John Sarbanes of Baltimore County.